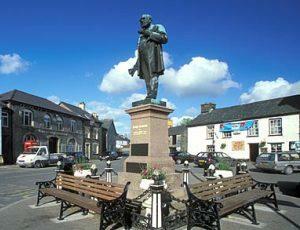 Twm Town Walk at Tregaron01970 612125workWalking Route1. From the Talbot Hotel, walk over towards the bridge. Turn left, immediately before crossing (by garage), to go through a gate into the churchyard. Bear right to walk along a tarmac path and keep straight ahead between houses until the road widens and you can see a steep, narrow tarmac path leading uphill on your left. Take this to the top and turn right onto the road, then swing left onto the new drive, opposite the Fire Station. 2. Continue to a cattle grid and then bear left, over a stile. Keep the field edge to your left for a few paces and then bear right to drop into a dip and then climb steeply to a stile in the fence above - note there are two stiles quite close together here and you need the left hand, higher one. turn right to follow the drive to the road. Turn left to follow the road easily down and then turn left again to return to Tregaron passing a house named Porth y Ffynnon built close to where Twm Siôn Cati, the local 16th Century outlaw, was born. Suitable for: Most walkers, energetic children. Dogs on lead around livestock. 1. From the Talbot Hotel, walk over towards the bridge. Turn left, immediately before crossing (by garage), to go through a gate into the churchyard. Bear right to walk along a tarmac path and keep straight ahead between houses until the road widens and you can see a steep, narrow tarmac path leading uphill on your left. Take this to the top and turn right onto the road, then swing left onto the new drive, opposite the Fire Station.